Hummus is originally from the middle east cuisine where it has been used as a starter or just as a snack for many years. In the recent years hummus has become pretty famous in Denmark. 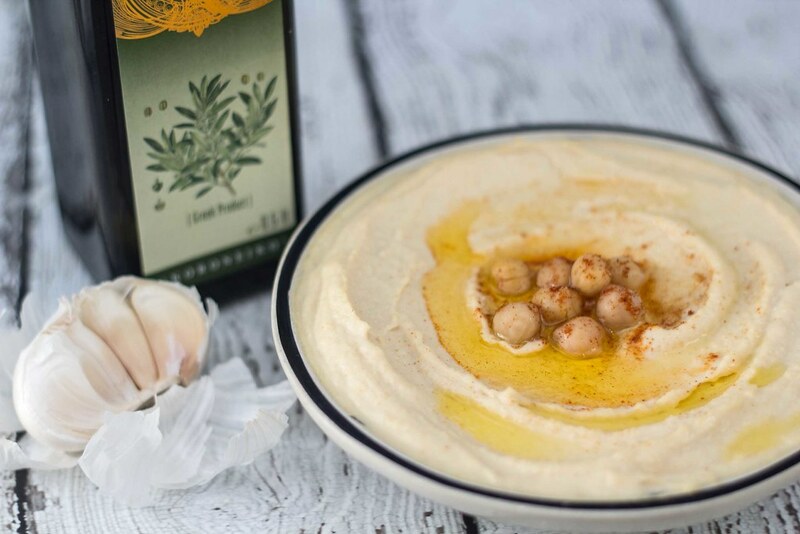 Hummus is a kind of dipping or spread for bread and is based on the six ground ingredients chickpeas, olive oil, tahini, garlic, lemon juice and salt – super simply and still it has a wonderful taste. This recipe for hummus is fairly easy to make. We have used this recipe many times and served the it for both friends and family, each time with great success. We normally use the hummus as spread on this braided bread or on this healthy bread made by 6 different kinds of grains, nuts and seeds. If you haven’t tried making your own homemade hummus before you should differently try this one out. Originally hummus is made with tahini paste. Tahini paste is made from ground hulled sesame seeds and is used as dipping, however, it’s mainly known as one of the main ingredients in hummus. 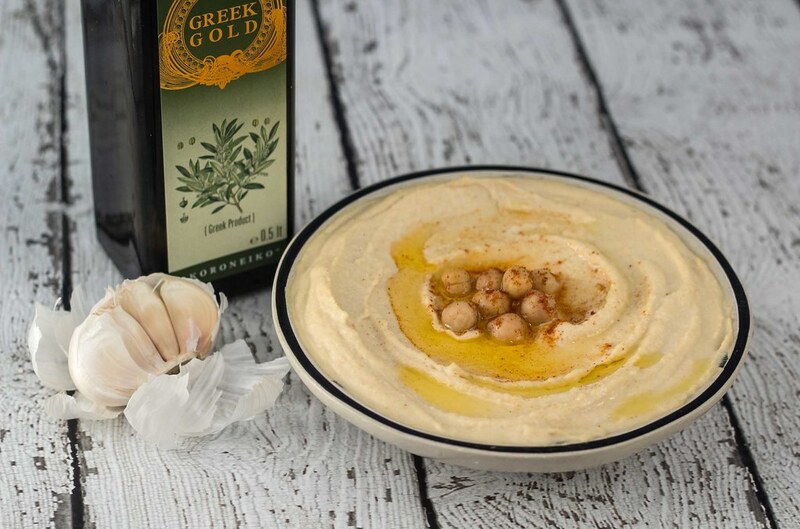 We personally think that hummus gets a better taste from Tahini, so we will differently recommend it. Tahini can be bought in most shops that sells food products from the middle east or at larger supermarkets. 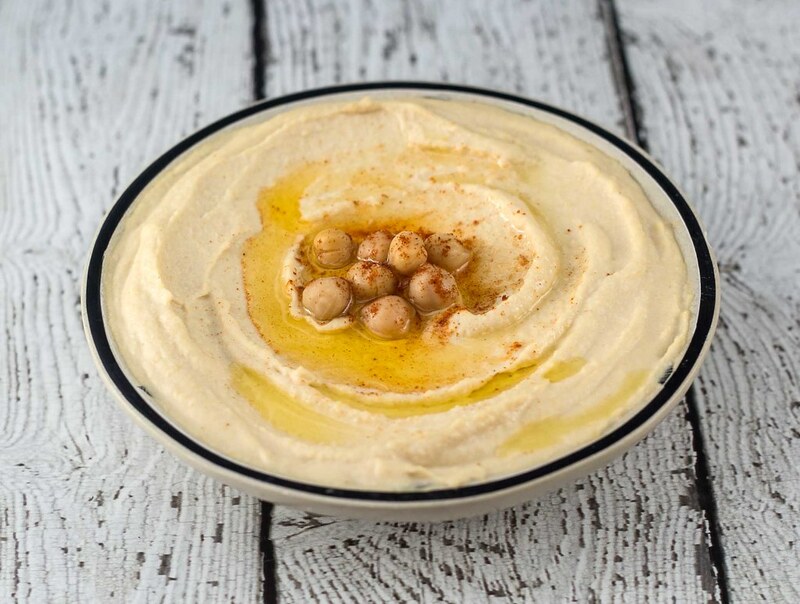 If you what to make some hummus in a hurry you can buy the canned chickpeas that are already boiled – this will save you a lot of time, however, preboiled chickpeas are way more expensive compared to the dried ones you have to boil yourself. We always buy a large bag of dried chickpeas (2 kg – 4.5 lb) and boil all of them all at once. Then we bag the boiled chickpeas together with some of the boiling water in bags of 400 g (14 oz) and store them in the freezer. When we want some hummus we simply just defrost one bag in the micro-oven and go directly to the step where all the ingredients are blended together – this will save us all the work of the boiling part. 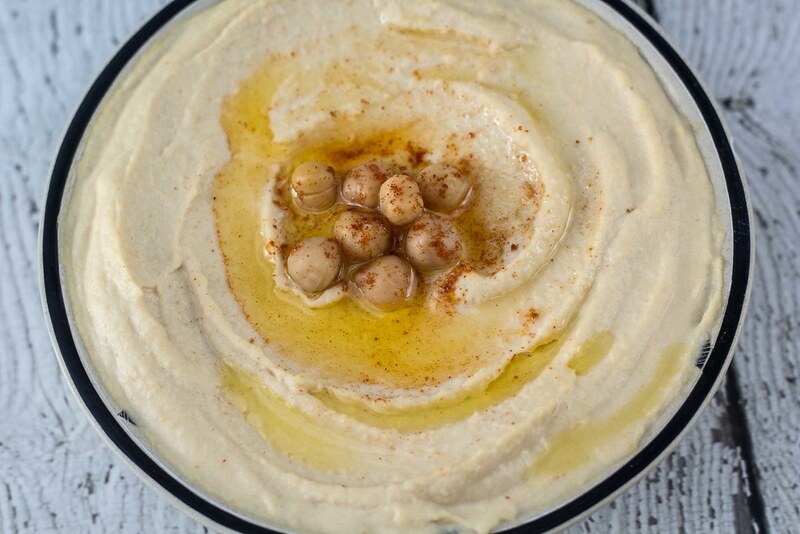 As said earlier we have used this recipe for hummus many times and we think it’s perfect. However, if you want you can easily add some extra water or olive oil if you want a more smooth consistency. Or you can add some extra garlic or tahini if you want some more taste. We will recommend you to experiment a bit so you get the exact taste you like. Step 1: Pour all the dried chickpeas in a large bowl or sauce pan and fill it with water so that all the chickpeas are covered. Let them soak in the water for at least 10 hours. If you have bought canned chickpeas that are already boiled you just skip to step 5. Step 2: Discard all the water and rinse the chickpeas thoroughly. Step 3: Pour all the chickpeas in a large sauce pan and add new water. Boil them for at least 1 hour. It’s preferred to boil them for about 1.5 hours. Step 4: Save about 1 dl (1/2 cup) of the water used to boil the chickpeas. Let the chickpeas cool off for about an hour. Step 5: In a blender, mix all the boiled chickpeas, 1 dl (1/2 cup) of the boiling water, tahini paste, olive oil, garlic, salt and some lemon juice. Blend all the ingredients well. It normally takes about 3-6 minutes to get a nice and smooth hummus. If you want a more smooth hummus add some extra water or olive oil. Season with salt and lemon according to taste. Step 6: If you have the time let the hummus rest in the fridge for about 1 hour. Then the taste will be better. However, you can eat the hummus right away. Tip: We always boil about 2 kg (4.5 lb) of chickpeas and divide them in bags of 400 g (14 oz) and add 1 dl (1/2 cup) of the boiling water. Then we close the bags and put them in the freezer. The next time we want some hummus we simply just take one of the bags from the freezer, defrost it and start at step 5 in the instructions list. Then we have fresh and delicous homemade hummus in no time.